· Wifi FPV (First-person view) Worlds smallest FPV Quadcopter, with instant transmitter video review., 6 AXIS GYRO The latest 6-axis flight control system is easier than ever to control, with stronger wind resistance, and greater stability., HD Camera The Hubsan X4 H107D + also comes with a HD camera (resolution: 1280x720). 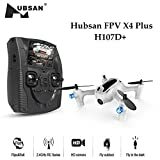 Ideal para taking aerial photos and videos., Intelligent Orientation Control/Headless The Hubsan X4 H107D + features Headless (IOC) flight mode, which makes flying much easier than before. Headless Mode Eliminates the Need for a Nose, as it can be flown in any direction regardless of which end is in front or back., Altitude Hold Equipped with the latest altitude hold technology that allows for stable flight to get better images.